Lee Newman Chief Executive Officer, MullenLowe U.S.
Lee has a passion for innovation and a belief in the power of creativity to achieve extraordinary business results. 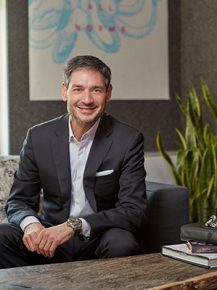 At MullenLowe U.S. he oversees all four domestic offices, ensuring seamless integration and collaboration in our work for leading challenger brands including Acura, JetBlue, Patrón, U.S. Cellular, Ulta Beauty, Royal Caribbean and American Greetings. Prior to joining MullenLowe U.S, Lee served as president of Ogilvy Chicago, managing all aspects of their integrated offering. Before that, he served as managing director of Wieden+Kennedy Amsterdam. During his four years there, the office added new clients, significantly increased profitability and expanded its footprint to include Russia and the Middle East. In 2011, The Gunn Report named Wieden+Kennedy Amsterdam the most creatively awarded agency in the world. Over his career, Lee has worked with many prestigious companies to build some of the world’s strongest brands including BMW, Coca-Cola, Nike, P&G, Kimberly-Clark, Heineken and Levi’s, to name just a few.